There are some Christmas traditions in our home that are very special to my family. Every year, the children look forward to receiving a note from Santa that he has left behind on his plate of cookie crumbs after his visit. This year, my children are in for an even bigger surprise with the “Your Santa Story” customizable DVD. What is “Your Santa Story”? It is a creative, fun way to keep the magic alive on Christmas morning. You will begin your story by answering a series of personalized questions and filling in the blanks at the “Your Santa Story” website. There are helpful hints/tips along the way making the process very simple to complete. Then simply check out and wait for “Your Santa Story” to arrive. It was so amazing for me to preview our personal “Your Santa Story” DVD. The quality was exceptional and Santa was quite a warm and jolly fellow as he spoke directly to my children and congratulated them on their accomplishments. In fact, it was so lovely that it actually brought tears to my eyes and I can’t wait for Christmas morning so I can watch it with them as I know they are going to be just thrilled! “Your Santa Story” even offers special requests for military families, sign language, Spanish speaking families and Ex Pat families. 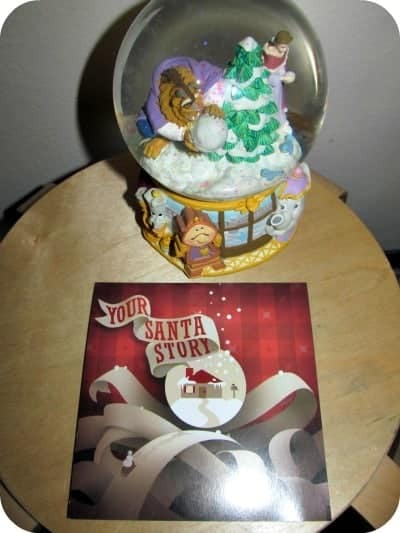 There are limited quantities available for “Your Santa Story” in 2012 so hurry over to the website to watch a preview and make a magical moment DVD for your little ones! These would make wonderful gift ideas and I will definitely do this again next year too to keep the magic alive in our family. It is truly special and one of the favorite products that I have had the pleasure to review this holiday season. Your Santa Story personalized DVD is available for purchase for only $29.99! Ready to begin “Your Santa Story”! Connect with “Your Santa Story” on Facebook to check out the latest offers! Oh, man, this would be perfect to leave for the girls on Christmas morning! Off to check it out … thanks! Your girls will LOVE this it is so neat and what a keepsake to treasure! I really like this because it confirms to all skeptics that there is a Santa, especially your children. Was watching the Santa Clause and I love the scene when the step dad says to Charlie “how do you know he exists if you have never seen him?” Charlie responds ” have you ever seen a million dollars?”! I ordered this for my daughter! Yay…she will love it! I am excited to show it to my family Christmas morning too! That would be so cool for my daughter she would love it. My daughter and son would LOVE this, what a fantastic idea! Wow, this is a great idea. This would’ve been wonderful to have when my nephews were young. What a great gift for the kids who love Santa. This reminds me that we used to have Grandpa call and be Santa on Christmas Eve.